Flavor enhanced nylon. 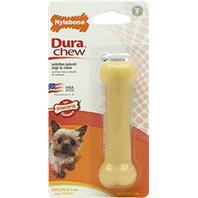 This is not a consumable chew toy. Small pieces no larger than a grain of rice should pass through safely. Supervise dog while it chews on this toy so that the dog does so in a safe manner. Size: petite. Nylabone - Original Bone - Petite product is categorised under Wholesale Nylabone Products, PA products, Wholesale Dog Products, Wholesale Toys, Wholesale Chew Toys.